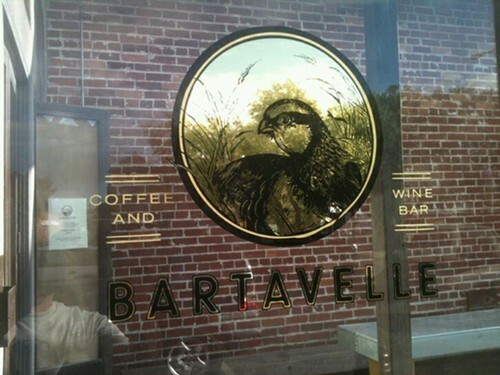 1) Those of you still waxing nostalgic about the dearly departed Cafe Fanny will be happy to hear that 1603 San Pablo Ave. is once again open for business: Bartavelle Coffee & Wine Bar started its soft opening yesterday, October 23. Berkeleyside reports that, “soft” or not, lines were already out the door and “folks were nibbling on avocado toasts paired with a glass of white wine.” The cafe’s hours are 7 a.m. to 6 p.m., Tuesday to Sunday. Check out these tentative breakfast and lunch menus, posted on Facebook — sounds like it’ll be at least a few days before all those items get rolled out. 3) Inside Scoop reports that the nonprofit People’s Grocery (heretofore mostly known for its CSA program and its traveling produce store) is in the final fundraising stages for a long-awaited grocery store in West Oakland — a project that’s been some ten years in the making. If all goes according to plan, People’s Community Market will open before the end of 2013. Meanwhile, People’s Community Market will kick off a “community investment campaign” to raise the final $1.2 million the store needs to open. A gathering in Oakland this Thursday, October 25, will be the first of several “Front Porch” events to bring the pitch to potential investors — the free event (featuring talks by the vegan chef Bryant Terry and Bi-Rite Market owner Sam Mogannam) is completely booked, but you can put your name on the waitlist to be notified of future sessions. 4) Meanwhile, in North Oakland, another laudable venture: A workers’ co-op is partnering with the Phat Beets Food Justice Collective to open Crossroads Cafe, a cafe and community kitchen located at 942 Stanford Ave. (in the same lot where the Phat Beets Saturday farmers’ market is held). The co-op has launched a campaign on Indiegogo to raise funds that will go toward equipping the new facility. 5) Uptown’s Sweet Bar Bakery (2355 Broadway) should be ready to open by mid-November, Eater SF reports, after chatting with owner Mani Niall about his dessert-themed design aesthetic (with an ice cream sandwich color scheme and a space that’s “shaped like a giant slice of pie”). Decor at PS Eatery (via Facebook). 6) According to Alameda Patch, a new restaurant called PS Eatery (Park Street Eatery) is coming to Alameda, at 1363 Park Street (obviously). 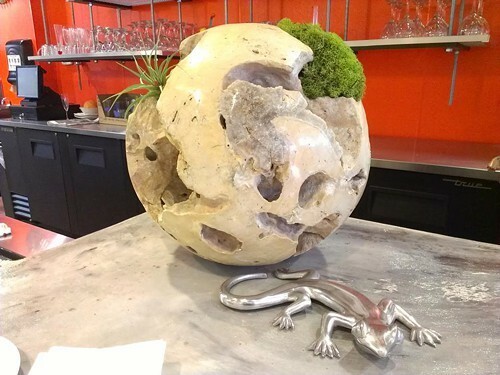 The focus will be New American cuisine, environmental friendliness, and garden/terrarium-themed decor. Owner David Le says the restaurant should be ready to open in three weeks. 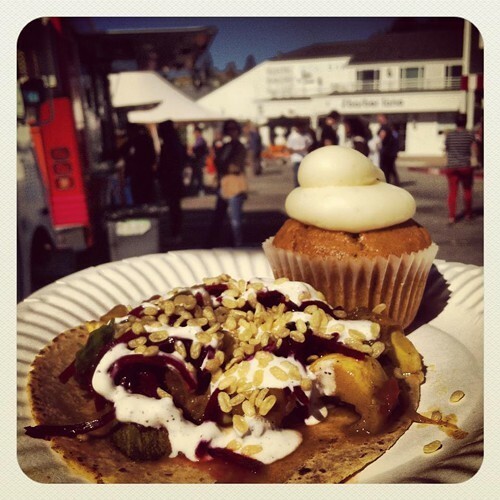 Squash tagine taco (Taco Guys) and pumpkin spice cupcake (CupKates) at Off the Grid. 7) Next Wednesday’s North Berkeley edition of Off the Grid (5 to 9 p.m.) will be loosely Halloween themed, with vendors featuring dishes using “spooky” cuts of meat and/or autumn produce. Look for beef heart tacos (Taco Guys), fried pig ear toasts (Fins on the Hoof), blood orange creme brulee (Brass Knuckle), caramel apples (Skylite Snowball), pumpkin spice cupcakes (CupKates), and more. 8) On a somewhat related note, Bocanova will be celebrating El Día de los Muertos (the Day of the Dead) during its next Rick’s Supper Club monthly dinner, at 7 p.m. on Thursday, November 1. A few of the featured dishes from the five-course dinner ($68): roasted poblano quesadillas, Mexican shrimp cocktail, roasted chicken with chorizo sauce, and passionfruit flan. Wines from Heintz Vineyards and Winery will be available for purchase.